I will be stuffing my face with a lot of food today, how about you? 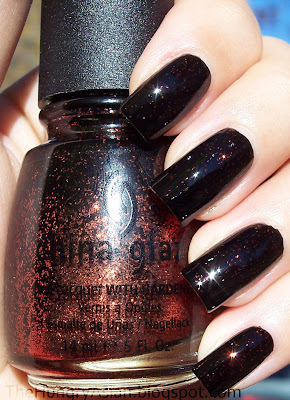 This is the China Glaze halloween glitter made for Victoria Nail Supply called Black Magic, I knew I had to have this when I first saw it at Body and Soul. This is 2 coats and 2 coats of Seche Vite to smooth it out. Maybe I should have shook my bottle, I thought it would be more glittery. I still love it, the little bits of orange glitter looks like glowing embers to me. It is gorgeous !!! I love this color ! what's the difference between this and fortune teller? Happy Thanksgiving to you and your family! 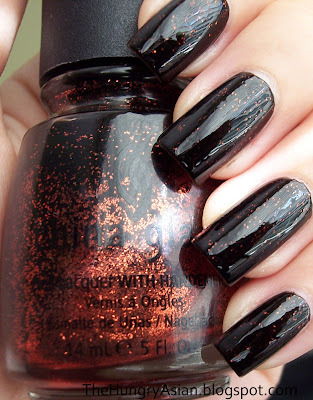 That looks so pretty, I really like this one, more subtle than some of the other Halloween polishes. Isn't there tons of glitter in the bottle?!! Happy Thanksgiving, go head, eat that food up cuz I will be too. lol This is a super pretty color. This is a beautiful color, perhaps it's just as well you didn't shake the bottle, that way there's a little less orange glitter and it looks avec more special. I meant: "....it looks EVEN more special." Ooo, that is a beautiful color!!! Hi Kae! Hope your belly was well filled! I had a nice dinner. I ordered this shade also. I don't have Fortune Teller so I grabbed at this one. Nice to see it swatched since I haven't worn this. Your nails look beautiful as always. Hmmm, to be honest I'm sick of black with glitter in it, especially orange/gold. Next year show it to me again and i'll be all over it. I wore Fortune Teller like once or twice and after seeing it on everyone's blogs... bleh, lets move on. This is gorgeous though, I do really love the glittery blacks, but I'm just so ready to move on.